My son is in there somewhere. I’ve experienced quite a number of concerts over the years at the Royal Albert Hall. But the one I had the privilege to attend on Monday night ranks possibly as the best. Let me declare an interest, I was the parent of one of the performers. But the same goes for nearly all the 3,500 other members of the audience. For this was the Camden Music Festival, a bi-annual event which brings together schoolchildren aged between six and eighteen from across the London Borough of Camden in an extraordinary spectacle of collaborative music-making. It wasn’t simply parental pride that made this a heart warming event. It was an ambitious, entertaining and impressive performance of undeniable quality. And it exemplifies important characteristics of the value a local authority can deliver to its community even in a time of austerity. The concert performers comprised five music ensembles – an orchestra, a jazz band, a concert orchestra, a ukelele orchestra and a troupe playing African drums – the massed choirs of every state school in the borough and multiple conductors holding it all together. The evening opened with a spine-tingling recital of the O Fortuna chorus from Orff’s Carmina Burana, accompanied by pianos and explosive percussion. I don’t know what I had been expecting of the evening but it wasn’t this. I instantly recognised that I was witnessing something very special as the harmonies of 2,000 young voices echoed round the Albert Hall, and swirling lighting contributed to the dramatic impact. Carmina Burana is a complex piece for children. I sat marvelling at what my son must have been making of it all: the awe-inspiring hall which he was visiting for the first time and the huge impact of the performance, each child’s incremental contribution slight but in aggregate literally amazing. The programming was thoughtful. It offered music of different genres that was more engaging for both performers and audience than I have previously experienced in school performances: big band, 60s soul, world music, and contemporary rock and pop. The arrangements of the latter were, on the whole, superior to the original versions. 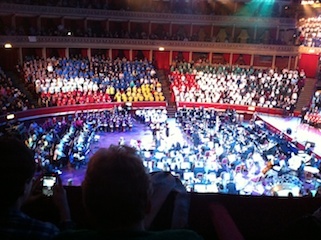 It was moving to watch young soloists stand before the Albert Hall audience to deliver performances of great poise as well as courage – and to watch musicians of the bands move between the different ensembles, switching genres with ease and accomplishment. The evening was compered by the newsreader Jon Snow, a redoubtable resident of the borough, and we were treated to speeches from the leader of the council and the mayor. Each laid on the propaganda of local authority achievement a bit thick. But there was no denying the truth of the message they wanted to convey. Only a local education authority could pull this off. To appreciate the power of this event, the context is important. Camden is a borough which blends affluence and deprivation. There is a very high rate of opting out of state education. My son’s school is surrounded by some two dozen private schools within a radius of less than a mile. So the schools which participated in the concert – particularly the secondary schools – represent those in which a large proportion of the community have little confidence. By definition, therefore, their students are drawn from the less advantaged parts of the community. The concert brought everyone together in an affecting way. Pupils from the Frank Barnes School for Deaf Children were joining in by signing. The diverse cultural backgrounds of Camden’s population were reflected in the choices of music. Many of the performers were inspiring role models demonstrating maturity, commitment and confidence – all the qualities you want a good education to nurture. The quality of musicianship and the demeanour of the performers told a corporate story of aspiration by educators for their students; a reminder that it is not only league table performance that matters but the ability of schools to provide a rounded education. And the fact of the event itself showed imagination and determination by town hall officials to create an unforgettable experience for children and parents, even in the most unpropitious of economic climates. As I left the Albert Hall, I reflected that an event of this kind in an iconic national building is an opportunity unique to Londoners and to have staged it was a sign of great enterprise. A local council is a complex thing. While I know mine undertakes unsung work of compassion for people at the hard end of things, too often it also avails itself of the opportunity to be self-serving and indifferent to the interests of the community. It will have won itself quite a few friends through the leadership which produced this life-affirming spectacle.